Happy New Year and I am pleased to be optimistic about the fishing in 2015. Though I am the secretary of AFTR (John Toogood is Treasurer), the points made and decisions to write about topics are mine and not those of the AFTR. There have been two issues. They are the Waikato Regional Council (WRC) spraying of vegetation in the lower river (Hydro Pool to Smallman’s Reach) and Epro dealing to noxious animals with poisons. WRC are spot spraying any vegetation in excess of 1.5 meters to maintain an open flood channel. This programme has been well advertised. Spot spraying will next be conducted on the gravel shoals below the main road bridge. Spot spraying has occurred to date above the bridge with willows and pine included in the programme. 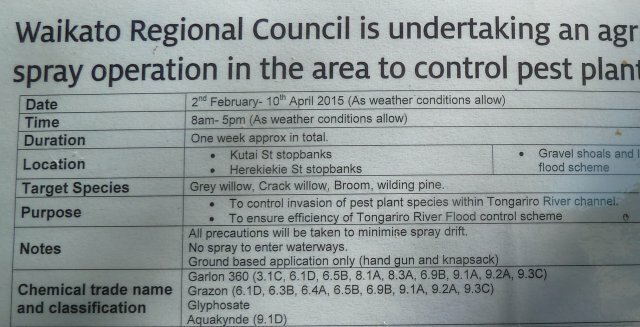 Further to my last email regarding the spray programme on Tongariro River. I have changed the chemical to be used from Glyphosate to Garlon 360. Garlon 360 will target only the woody weeds (willow etc) and will not harm any of the grasses or sedges on the gravels. The objective from our Tongariro River management document is to manage the floodway in such a manner that a 1% AEP flood flow can travel through the floodway without over topping the flood scheme. To do this it is necessary to remove vegetation from the floodway that is in excess of 1.5 metres in height as this type of vegetation is an impediment to flood flows. Grey willow is the major weed here. As this plant has a windblown seed this pest plant is a weed of wetlands, stream and river margins. This work is a permitted activity under the Regional Plan, and does not allow for any sprays to enter waterways. WRC will shortly (early March) continue approximately 50 meters of the riprap started last year at the end of Herekiekie street. I am told that this will not involve any river diversion work as happened last year. A digger will place rock against the bank into the river to protect property in that area. Epro have advised they have a contract with TBfree NZ Ltd to undertake a TB vector control (possums) operation within the Turangi area which involves possum habitat surrounding Turangi and the Tongariro River including the Tongariro Delta.Poisons used will include sodium fluoroacetate (1080), phosphorous, brodifacum, cholecalciferol and cyanide, trapping and shooting. There are two parts to this matter. The first is to hand lay vertebrate toxic agents. Signs are around the town warning of what is going on. Map 1 is of the entire control area. Map 2 is the area where pellets will be dropped by helicopter. They willuse Sodium Fluoroacetate (1080) pellets. This operation is scheduled for 1 February to 30th June 2015 and involves the wetlands from the Waimarino stream through to the Tokaanu tailrace. Hi Eric, is this what you are after? Please note that there have been a couple of areas that have been removed from aerial application but are not shown on this map, the first area is between the Yacht Club (Frethy Rd) and the Waiotaka River. The second area is the true left of the Tongariro river off the end of Awamate Rd These two areas will now have ground control techniques applied. Hi Eric, please find attached requested map, as explained on the phone this map displays the entire control area for the Turangi operations, within these area’s we use several control tools, if the aerial map that I sent is read in conjunction with this map you should be able to determine the split between ground control and aerial control around the Tongaririo river and immediate surrounds. I have placed the correspondence from Epro on this matter on the home page of our website. During the summer months dry fly angling has been good with some good conditioned, good sized fish taken. In the last few days there have been some equally good fish taken by wet fly. Brown trout are in numbers in the lower river and are being caught through the river. The exciting Cicada fishing of last year at this time has not happened with few Cicada around. Lake fishing has had its moments. Some fish caught on the lake have been excellent (shape, colour, weight). 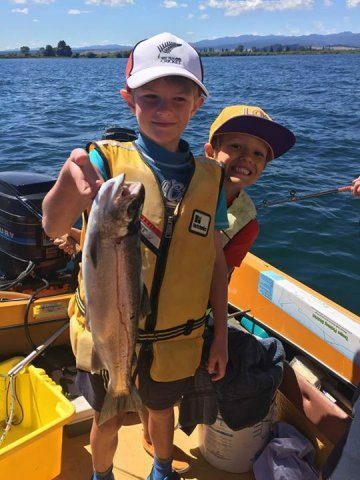 My grandchildren were fascinated when we fished the Hole with the vast numbers of smelt around the boat. I have watched the trout smelting in the shallows and the few fish I have caught have had smelt in them. There are still a lot of smaller trout, 2 to 3 lbs,( .9 to 1.4kgs) being caught. Two days ago Gary Brown of our committee caught a lovely 2.5kg,( 6lb) rainbow at the Delta. My fish was much smaller and was returned to the lake. The boat next to us landed a couple of fish. One on board waded and fished the shallows very successfully. 1. Annual Meeting. The Annual Meeting is set for the morning of Easter Saturday. More detail on this later. We have worked hard to develop good relationships with stakeholders and it is important that we maintain our membership to maintain our influence. We look forward to your continuing support. 3. Electronic communications. Our Annual Report will not be hard copy this year. The forat will be as in previous years but will be emailed as a pdf and also placed on our website. For those who do not have email we will post a photocopied summary (exclude the appendicies) of the report. Richard Kemp is the AFTR member on the TFAC committee. TFAC met on the 10th February. Committee members are Dave Wood of Waitahanui Anglers Club, Craig Woolacott of Taupo Fishing Club, Graham Whyman TALTAC, Matt Pate of Motuoapa Boating Club, Peter Baldwin of Tongariro National Trout Centre, Simon Jolly of Taupo Launchman’s Association, Ian Rodger of National Angling, Steve Sprague of NZ Professional Fishing Guides Association and Andy Garrick of Fish and Game (Eastern). Graham Whyman is Chairperson. DOC Fisheries are represented by Kim Turia and staff. There are teething problems with the electronic licensing system but these are being worked on. Some frustration was expressed at the meeting with current difficulties. I am of the view that when we have successfully purchased on line we will accept the process. Licenses for 2014-15 will be mainly on line sales with a reduced number of outlets having paper licenses. Retailers are entitled to charge an additional cost for their part in selling the license. I purchased annual licenses for each of my grandchildren who were here for Christmas holidays. The first license was frustrating but the others were easy. I had to do 4 internet banking transactions rather than one but I think this will be remedied pretty soon. I had to wait and receive an email stating that the actions were successful before I could print the license as I didn’t have a smart phone to keep an electronic copy of the license. The license on a smartphone is acceptable to DOC rangers. I see the following defect in electronic licenses. There is a requirement that licenses require a signature and a photo but in electronic form I find this difficult until DOC can advise how this is done. The new license does not have the detail that is on the paper license. That is it does not have the map of the Taupo Fishing District nor the summary of the Taupo Fishing Regulations. I see no reason why the printed license can not have the same information that is currently on the paper licenses. The rules and regulations are on the DOC website but not easy to access. The DOC website is not easy. It is too big. Target Taupo changed. It soon lost the hunting information and became dedicated to the fishery. It became a large glossy publication worthy of keeping for its informative articles and great photos. But it was expensive to produce and with a tight budget the method of communication is to change to an electronic format. Faster communicaions are being investigated for DOC to notify anglers of intended changes and change when made. The committee received a report detailing fishery offences. It is interesting to note that people using spinning rods in fly waters only have been apprehended, using 2 rods, fishing prohibited waters, bait fishing including roe, undersized fish and false information. The one that most interested me was fishing within 300 meters of the river mouth. There are black and white poles at river mouths. They simply indicate the presence of a river mouth which may be shifting. The 300 meter mark is from the centre of the river mouth. I will put on our home page Peter Shepherd’s Partnership update and Mark Venman’s Fishery Monitoring report. Part of the intention behind the TRT was to introduce non anglers to the beauty of the local environment and to increase support for maintenance of the environment. The average daily numbers from the trail counter has been 22 or 8000 for the year. This figure is growing and there is a significant increase expected in 2015. It is good to see people using it and enjoying it. Many locals use it daily for their well being and enjoyment. Great. Early in January some damage occurred in the Tongariro National Trout Centre (TNTC) car park when an articulated truck tried to turn around by driving through the TNTC car park. It was too tight a turn resulting in some damage. Hopefully we can all enjoy and look after the river and its environment.